We’ve all seen them. We may be driving down an interstate and notice the out-of-place hued wall that draws our eyes away from the bumper-to-bumper traffic for just a second. Or maybe we see them on a social media feed escorted by a punny caption and hundreds of likes. Regardless of how we’ve encountered the art form, wall murals have taken the world by storm. But we rarely think or even wonder about the artist behind the mural. For Erin Miller Wray, an artist and designer based in LA, art has always been in her blood. “I remember winning some little competition in the second grade, and we had our drawings hanging in the school lobby. That was like a huge deal for me,” Erin recalls. She’s come a long way since having her drawings hanging for all of her classmates to see. 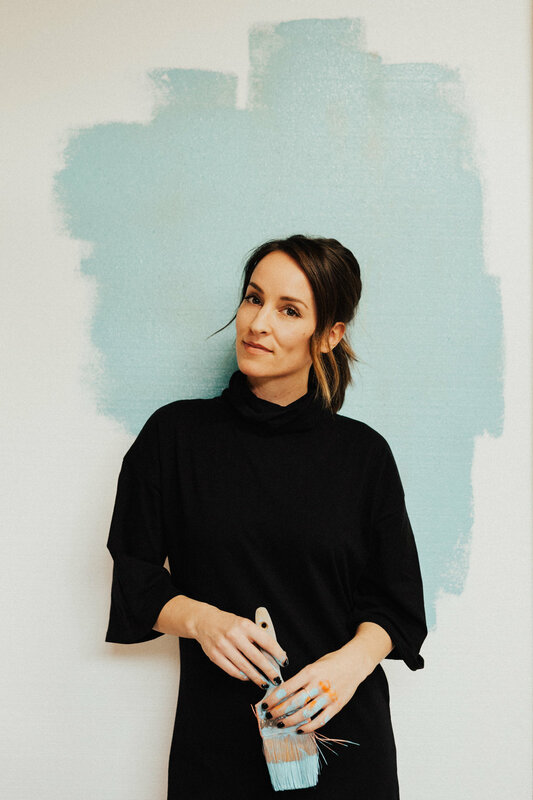 Erin has worked with notable companies such as Walmart, Tastemade, and Tommy Hilfiger, to create one-of-a-kind painted designs. But what makes Erin’s passion stand out is the sheer size of her work. The scale of these massive pieces of art is what attracted her to the unique profession in the first place. In 2014 Erin was practicing calligraphy and hand lettering when she took notice of a growing trend on social media. “I started to notice people taking pictures in front of these giant walls, and I wondered how my work could translate to something like that,” she says. She imagined how amazing it would be to get on a lift and climb up the side of a building and paint something huge that she had originally drawn on a normal piece of paper. What intrigued her most about the unique art form is how fascinated people were with these larger than life paintings. With that, she knew she had to give it a try. Erin’s opportunity came when a non-profit organization her sister was working for, RedZone Ministries, moved into a brand-new building with a massive 64-foot blank wall. This was it. Erin saw this wall as a huge blank canvas with endless possibilities. The organization agreed to entertain her dream, and that was her first attempt at creating something on such a grand scale. Commuting from LA to Memphis, Erin began to see all of the potential these brick and cinder block walls possessed. She saw the opportunity to bring not only color to an environment, but also a message. But creating a design that is so grand in scale isn’t exactly a walk in the park. “From that first mural I crashed and burned a million times trying to figure out how to properly do this. I didn’t know any muralists, so I was teaching myself as I went,” she said. Over time she learned to get stronger and smarter with her craft and has traveled all over the country leaving her mark in the form of colored paint on cinder block walls. Erin approaches each challenge differently, depending on what her client is looking for and how much freedom she is given. The beginning phases start with an idea being sketched onto paper or on her iPad. Once that sketch is approved, the real fun begins. While some muralists like to use projectors to cast their sketch onto the wall, Erin prefers doing it the old-fashioned way. Her favorite part of the process is hand-drawing it onto the wall. “I love just redoing the image onto this larger scale,” she says. “I’ll measure out the wall and do tick marks and center lines, then sketch it all back out with chalk. Then I just fill it in with paint.” This approach to mural painting is extremely tedious as it involves a lot of ups and downs and stepping away from the wall to make sure everything lines up. With a team of three to four people, it normally takes the crew about four to five days to complete one mural. Because murals are regularly popping up and need to stand out, Erin is constantly seeking new forms of inspiration for her work. She finds this inspiration often times from other artists. “I love going to museums, looking at books, and seeing what other people are talking about and drawing and painting about,” Erin says. “It’s such an interesting time politically and culturally, and there are just so many people with a message right now. It’s so interesting for me to see how they are relaying that message through their art,” she says. Having such a unique profession has given her the opportunity to try things she’s never thought of before--such as painting a mural in the middle of downtown that asks that famous question: Will you marry me? And her art did just that. Although there were no surprise proposals, she did witness two people re-propose, as well as some awkward encounters, with her design. Sometimes the outcomes are fun to watch but other times it’s the process of creating the mural that really stands out, such as the time she worked with RIFA (Reaching Out, Lifting Up), a soup kitchen in Jackson, Tennessee. “I broke down and cried two times because of the patrons who would greet me in the morning and cheer me on,” Erin says. Her reaction to their kindness was brought on by the fact that these people had rarely if ever been exposed to any kind of artistic process before and were now watching something beautiful come out of seemingly nothing.